interested in receiving emails about. Enter mobile number with area code. Enter mobile number again to verify. Once you click continue, you'll have the option to earn another 500 bonus points by enrolling in paperless billing. *This consent is not required to make a purchase. Gap Inc. Visa cards are issued by Synchrony Bank pursuant to a license from Visa U.S.A Inc. This consent is not required to make a purchase. 1TMMR TERMS – By opting in, you are agreeing to receive automated SMS messages regarding the Text Me My Rewards Program from Athleta and Synchrony Bank at the number you provided above. To complete your Rewards via mobile phone, respond YESATTMMR, to the confirmation message you will receive. Depending on the number of rewards you earn you may receive up to 11 text messages each month per card. Msg & Data Rates May Apply. Carriers Supported: Alltell, AT&T, Sprint, T-Mobile®, Verizon Wireless, Boost, Cricket, MetroPCS, Nextel, U.S. Cellular, Virgin Mobile, ACS Wireless, Appalachian Wireless, Bluegrass Cellular, Carolina West Wireless, Cellcom, C-Spire Wireless (formerly Cellsouth), Cellular One of East Central Illinois, Cincinnati Bell Wireless, Cross/Sprocket, Duet IP (AKA Max/Benton/Albany), Element Mobile, Epic Touch, GCI Communications, Golden State, Hawkeye (Chat Mobility), Hawkeye (NW Missouri Cellular), Illinois Valley Cellular, Immix (Keystone Wireless/PC Management), Inland Cellular, iWireless, Mobi PCS, Mosaic, MTPCS/Cellular One (Cellone Nation), Nex-Tech Wireless, nTelos, Panhandle Telecommunications, Peoples Wireless, Pioneer, Plateau, Revol, Rina - Custer, Rina - All West, Rina - Cambridge Telecom Coop, Rina - Eagle Valley Comm, Rina - Farmers Mutual Telephone Co, Rina - Nucla Nutria Telephone Co, Rina - Silver Star, Rina - South Central Comm, Rina - Syringa, Rina - UBET, Rina - Manti, Simmetry, South Canaan/CellularOne of NEPA, Thumb Cellular, Union Wireless, United, Viaero Wireless, West Central Wireless. You can opt out of the SMS communications at any time. For help text ATTMMRHELP to 84831. To stop text ATSTOP ATTMMR to 84831. *Cardmember offers are subject to credit approval and Gap Inc. credit card must be used as pay type. $20 REWARD WHEN APPROVED FOR ATHLETA CARD: Offer valid 1 time. 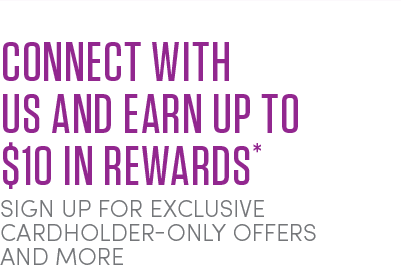 Cardmember will receive 2,000 bonus Reward points when approved for an Athleta Card. Account must remain open, in good standing, and not become delinquent. Points will post to your account within two billing cycles. ACCOUNT OPENING REWARD: New Cardmember Account will receive a one-time award of 2,000 bonus points, which equals a $20 Reward (Reward value not redeemable for cash). Account must remain open, in good standing, and not become delinquent. Points will post to Account within two billing cycles of account opening date. Only one first purchase reward per Account. See Reward program terms for details on earning and redeeming points and rewards. ADD AN AUTHORIZED USER: The primary cardholder will be liable for all purchases made on the account, including those made by an authorized user. ZERO FRAUD LIABILITY FOR UNAUTHORIZED USE: Unauthorized use does not include charges by a person to whom you have given authority to use your account or card, and you will be liable for all use by such person. BIRTHDAY GIFT: For cardholders who have made at least one purchase at Athleta with their Athleta Card within the last twelve months, whose account is in good standing. TWO EXPEDITED SHIPPING PASSES PER YEAR: Valid on purchases online at Athleta, Gap, Banana Republic, and Old Navy. Purchase must include Athleta merchandise. For cardmembers whose account is in good standing. This offer is good for expedited shipping only to your order's first "ship to" address anywhere in the U.S. including Puerto Rico. Offer subject to change. Unique promotion code will be delivered to the cardholder once per year. NO ANNUAL FEE: For new accounts: As of 01/01/2019, Variable Purchase APR is 28.24%. The APR will vary with the market based on the Prime Rate. Minimum interest charge for the Gap Inc. Visa card and for the Gap Inc. credit card is $2.00. The APR will vary with the market based on the Prime Rate. CONNECT WITH EMAIL & EBILL: Offer valid 1 time. Cardholder will receive 500 Bonus Reward Points when they submit a valid account number and email address and 500 Bonus Reward Points when they sign up for eBill. Account must remain open, in good standing, and not become delinquent. Points are awarded within two billing cycles. Please see your Reward Program Terms for details. Gap Inc. Visa Cards are issued by Synchrony Bank pursuant to a license from Visa U.S.A. Inc.
Get to know the Athleta Visa® Card. 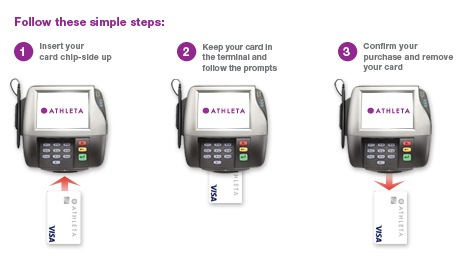 The Athleta Visa Card includes chip & signature technology for enhanced security. What is chip & signature technology? Simply put, it's extra security at chip-enabled terminals that makes unauthorized use of your Visa card information tougher. The chip works just like the magnetic strip on typical cards, except that it encrypts the information. Is chip & signature the same as contactless payment? Nope. A chip & signature card must be inserted into a slot in a chip-specific merchant terminal. I just received my new chip & signature card. 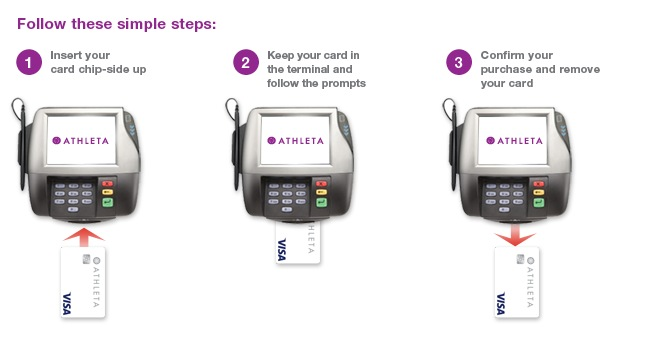 Activate your new Athleta Visa® Card by calling 855-327-9209 or by visiting athleta.com/activate. 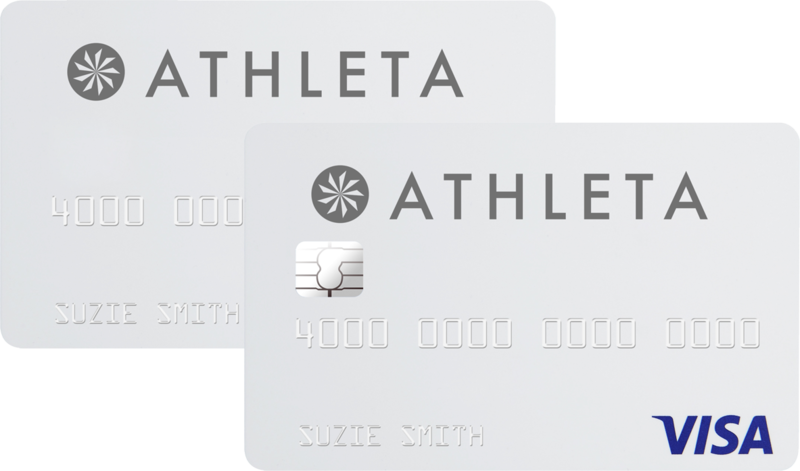 If your card is a replacement for a previous Athleta Visa Card, log in to your account to update any recurring payment information. How do I use my chip & signature card? Just insert your card into the chip-specific merchant terminal slot and follow the prompts on the screen. What if the merchant doesn't have a chip-enabled terminal? You or the merchant can still swipe the card in the usual way using the magnetic strip. Do I need a PIN to use my card? Nope. Your merchant may require a signature to approve the transaction, but not a PIN. Where can I use my chip & signature card? You can use your chip & signature card everywhere Visa® is accepted, all around the world. Chip & signature terminals are more common in the U.S., Mexico, Australia, New Zealand, and some European countries. Where can I get more information about chip & signature technology? If you have further questions, please call the number on the back of your card to speak to a Customer Care Professional. All Gap, Banana Republic, Old Navy, and Athleta credit card or Visa cardholders and Gap Inc. Visa Signature cardholders are eligible to participate in the Gap Inc. Rewards Program. "Account" means a Gap Account, Gap Visa Card Account, Banana Republic Account, Banana Republic Visa Card Account, Old Navy Account, Old Navy Visa Card Account, Athleta Account, Athleta Visa Card Account or a Gap Inc. Visa Signature Account. The Gap Inc. Rewards Program is collectively referred to herein as the "Rewards Program". Note: this Rewards Program is separate from the BRIGHT Rewards program. Qualifying: The Rewards Program applies when you make a purchase using your Account and you meet these requirements: Your Account is: 1) open, 2) in good standing, and 3) not more than 2 payments past due both at the time you earn Reward Points (“Points”) and at the time rewards (“Rewards”) are issued and redeemed by you. The Rewards Program does not apply to cash or debit card purchases or purchases at Gap, Banana Republic, Old Navy or Athleta using credit cards other than one of the Accounts. In addition, Points are only earned on the Account used to make the purchase and are not based on the store in which the purchase is made. For example, if you use a Gap Account to purchase Old Navy products, you will earn Points on your Gap Account (and not on an Old Navy Account). If you have more than one Account, you cannot transfer or combine Points between Accounts. Points awarded for purchases that are returned, refunded or otherwise adjusted will be deducted from your Points total. Such deductions may result in a negative Points balance, in which case, any subsequent Points earned will be applied to reduce that negative balance. For every 500 Points you earn on your Account, you will receive a Reward value of $5 for that Account. Rewards will be issued in increments of $5, with a minimum value of $5 and a maximum value of $50. Rewards will be issued by the same brand as the Account. Multiple Rewards may be issued for an Account; however, no more than $250 in Rewards will be issued in any billing cycle. Any Points in a billing cycle that are either less than the amount required for the lowest denomination of a Reward on the Account or worth more than $250 in Rewards will be applied toward a Reward in a future billing cycle. For example: If you earn 2,700 Points on your Gap Account, you will receive a $25 Reward and 200 Points will carry forward in your Rewards balance for your next billing cycle; if you earn 5,000 Points on your Banana Republic Account, you will receive a $50 Reward; and if you earn 1,500 Points on your Old Navy Account, you will receive a $15 Reward. There is no limit to the amount of Points you can earn for an Account. Points earned but not used towards the issuance of a Reward will expire 24 months after your last purchase if your Account has been inactive (i.e., there has been no purchase activity on your Account) for 24 months. Rewards will expire as of the expiration date set forth in the issued Reward. Reward(s) will generally be issued on your Account on the billing statement for the period during which you accumulated the required number of Points for a Reward, or in some instances up to 2 billing cycles thereafter. birthday offer: Available for cardholders who have made at least one purchase on their Gap Inc. credit card at a Store Location that matches the Gap, Inc. brand on their Account within the twelve months preceding their birthday and whose account is in good standing. Not valid for Old Navy cardholders. Rewards Redemption: You can redeem a Reward within the valid dates shown on the Reward by either (i) presenting the Reward in store or (ii) providing the Reward code online or via phone. Rewards may only be redeemed at Store Locations towards purchases charged to your Account. You can redeem up to 3 Rewards on a single transaction in store, and up to 5 Rewards online or via phone. Rewards can be combined with one promotional offer, and they can be used to purchase items on sale at any Store Location. Rewards may not be redeemed at Intermix stores, intermixonline.com, Weddington Way stores, weddingtonway.com, or with purchases for the babyGap OutfitBox or Old Navy SuperBox subscription services. When redeeming your Reward, the value of your purchase must be greater than the value of the Reward(s), and you must use a Gap Inc. credit card as the sole payment type for all amounts owed over the Reward value. Rewards cannot be credited to an account, redeemed for cash or cash equivalent, applied to past purchases, or used for purchasing gift cards. If you return merchandise purchased with Reward(s), the dollar value of the Reward(s) allocated to item(s) returned will be converted to Points and credited to your Account within the next 2 billing cycles. If you did not use your Account, or if your Account is closed, the dollar value of the Reward(s) allocated to the item(s) returned shall not be refunded or credited. Returns are subject to Store Location Return/Exchange policies. Additional restrictions may also apply as stated on your Reward. Employees of Gap Inc. cannot combine Rewards with their employee merchandise discount. General Terms for Using Rewards: Rewards are not transferable to anyone else and may only be used by you for your personal benefit. You cannot combine your benefits with the benefits accrued by any other Rewards Program participant. Rewards are not “gift certificates” and are not intended for gift-giving purposes. Points and Rewards have no cash value and are purely promotional. Rewards cannot be used retroactively for prior purchases. Unless and until you complete the Program Terms and Conditions by presenting the Rewards at a Store Location, you do not have any right, title, or interest in your Points or the Rewards. We are not responsible for lost or stolen Rewards. quarterly bonus points: A quarterly bonus of 20% of Points earned as of the end of each calendar quarter (excluding bonus points earned during a bonus reward points campaign and merchandise returns). For example, if at the end of a calendar quarter you have earned 500 Points, we will add an additional 100 bonus Points to your Reward Account. free basic alterations at banana republic: Available on merchandise purchased at Banana Republic stores and bananarepublic.com. Not valid on previous purchases. Not valid on leather and suede merchandise. Offer subject to change. Merchandise cannot be returned or exchanged after being altered. free 3-5 day shipping: Offer valid for online orders placed at gap.com, bananarepublic.com, oldnavy.com, athleta.com, gapfactory.com, and bananarepublicfactory.com. This offer is valid on shipping to your order's first "ship to" address, anywhere in the U.S. (including Puerto Rico). If you choose another shipping option additional charges will apply. Orders must be shipped to a single address. Select the 3-5 day shipping option. No adjustments on previous purchases. Must enter one of the following promotional codes at checkout: Silver – mycard; Luxe – luxe; Navyist – navyist. Visa Signature Accounts: Select Accounts may be upgraded to a Gap Inc. Visa Signature Account at the discretion of Synchrony Bank (“Bank”) Gap Inc. Visa Signature Accounts will earn all the benefits listed above (as a Silver, Luxe or Navyist Account), plus additional benefits that will be communicated to the cardholder (such additional benefits may include bonus points earned for purchases, additional birthday bonuses and select benefits provided by Visa, U.S.A. Inc.). For Free 3-5 Day Shipping, enter signature as the promotional code at checkout. Removal From or Modification/Termination of Rewards Program: We reserve the right to remove any person from the Rewards Program in the event of any fraud or abuse as determined in our sole discretion in connection with this Program. We reserve the right to change or terminate the Rewards Program at any time and in any manner without notice. no warranty: gap inc., synchrony bank and each such company's respective subsidiaries, divisions, and affiliate entities, along with each such company's respective officers, directors, employees, and agents make no warranty, express or implied, including, but not limited to, any warranties of merchantability or fitness for a particular purpose with respect to the rewards program or any products of services related to such program. release of liability: you release gap inc., synchrony bank and each such company's respective subsidiaries, divisions, and affiliate entities, along with each such company's respective officers, directors, employees, and agents from and against any and all liability relating to your membership or participation in the rewards program or these terms and conditions. Complete Agreement: These Terms and Conditions, together with your Agreement (including, without limitation the “Governing Law” and “Dispute and Claim Resolution (including Arbitration) Provision” sections of the Agreement), make up the entire agreement between us relating to the Rewards Program, and replace any prior understandings or agreements (whether oral or written) regarding the Rewards Program. The Rewards Program is provided by Gap Inc. and serviced by Synchrony Bank.